Friends are coming over and your house smells like onions or fish. You can pull out the exceptionally expensive candles or scents that are available through any number of stores, or you can quickly create an aromatic environment using natural ingredients. For a cozy ambience: In a pot full of water, add a quartered orange, cranberries, cloves, and cinnamon sticks. Simmer on low and replace water as needed. For a classy ambience: To create a fresh, clean scent, let two cups of water come to a boil with a sprig of rosemary, vanilla extract, and the juice from half a lemon. If you toss in the rind, too, it’ll add zest. Sweet fragrance: Add orange slices, fresh ginger, and a spoonful of almond extract to a pot; cover with water, bring to a boil, and then simmer. Tropical: Fill a saucepan about halfway with water and add lime, coconut oil, and vanilla. As with the others, simmer on the stove replacing water as needed. Woodsy environment: A pot of water containing cedar or pine should be brought to a boil. To remove a strong odor, try adding two bunches of bay leaves to the mixture. 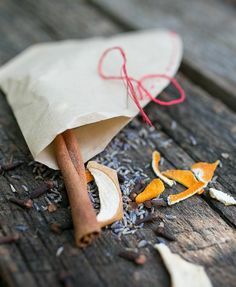 Calm: To conjure a soothing scent before bedtime (or anytime), mix dried lavender, anise, nutmeg, whole cloves, and a cinnamon stick with water and let it simmer until the whole house fills with the lovely fragrance. By planning ahead to gather and save the necessary ingredients from your garden each summer, you’ll be prepared to create the perfect sensory experience in your home. What was Buzzin’ in Your Backyard Last Summer? As a gardener, I understand the importance of having bees in my yard. But I didn’t always appreciate the buzzin’ around me, nor did I distinguish between bumble bees, honey bees, solitary bees, wasps and hornets. Now, I realize that bumble, honey and solitary bees are not aggressive towards me as I work in the garden among my flowers, vegetables and fruits. These bees are too busy working to worry about me. Instead of running away from the buzzin’, I stop to take a closer look at what kind of bee is diligently visiting blossom after blossom. Bees play a key role in agricultural production and the beauty of our yards through pollination. The disruption of natural habitats, the widespread over-use of pesticides, and many bee diseases and parasites has brought bee numbers down precariously low, especially honey bees. The honey bee crisis is broadly termed Colony Collapse Disorder. Almost 20,000 known species of bees populate the earth. 3,500 live in the United States and close to 400 in Wisconsin. Less than 2% of these are honey bees and bumble bees. The other 98% are mostly solitary bees. Solitary bees live on their own, not in colonies with a queen and workers like honey bees and bumble bees. Bees are unique among all pollinators (hummingbirds, bats, butterflies, flies and some beetles). Not only do they sip nectar to fuel their own flight, bees are one of the few animals to actively gather large amounts of pollen which they inadvertently scatter widely between flowers. The pollen of many plant species serves as the primary food source for bee larvae because it is rich in protein. Bee pollination is an ecological service valued at $20 billion a year in North America. More than one-third of the world’s crop species such as alfalfa, sunflower, fruits and vegetables are dependent on bee pollination. Honey bee numbers in North America have been de- clining since the 1950s while the amount of crop acreage requiring bee pollination is at an all time high. 1. Plant bee flowers everywhere! Flowers provide nectar and pollen for bees. Bees obtain all of their carbohydrates from floral nectar, and all of their protein from floral pollen. Honey bees convert nectar into honey and use the protein in pollen to f eed their young. Provid- ing a diverse array of plants will help ensure that you support a diverse array of bee species. 2. 60-70% of bees dig burrows in the ground preferring dry, sandy soil bare of vegetation. You can attract ground-nesting bees to your property by leaving some spots of exposed, undisturbed soil. The other 30-40% are cavity-nesting bees. These bees use hollow plant stems or holes in wood left by wood-boring beetles. You can attract cavity-nesting bees by providing tunnels in a man-made structure. Pesticides are designed to kill insects. Depending on the formula and concentration, they can be harmful or fatal to bees and other benefi- cial insects. Herbicides kill flowers that provide nectar and pollen for bees. In June 2013, over 50,000 bumble bees were poisoned in Wilsonville, Oregon, after a insecticide was sprayed on linden trees to control aphids, which secrete a sticky residue while feeding, making them a nuisance to parked cars. “The Oregon bee poisoning is a clear warning. We have to stop pesticide use in cases where human health or food security is not at risk,” stated Dr. Marla Spivak of the University of Minnesota, a leading global authority on bee health. According to Spivak, neonicotinoids are now the most widely used insecticides. They are long-lasting in soil and readily move into water. Sadly, most neonicotinoid insecticides have no warning labels to alert consumers about the potential hazard to bees, butterflies and other beneficial insects. To learn more about Wild Ones Fox Valley Area visit www.wildones.org. Winter is far from over and it seems like we get at least one or more days of freezing rain in late winter. The freezing rain will cause ice to build up on the branches of trees and shrubs, and you might wonder if there’s anything you can do to help mitigate potential damage in your garden. Usually, it’s best to just leave everything alone as a coating of ice for a day or two rarely hurts a plant. Branches may sag a bit, but then the ice melts or cracks off and all is well. If, however, the ice is quite heavy and more ice is due, you can reduce the weight, and therefore the risk of damage, by carefully removing some of the ice. Use a soft broom and gently tap the branches, cracking the ice so it falls off. You don’t have to worry about removing all of it — just enough to lessen the weight on the branches. Be careful not to hit the branches too hard or you may end up damaging the bark or breaking off the buds. Also, use caution with large trees or shrubs so you don’t drop ice or branches on your head! Ever wonder why we plant what we plant and who decided it? Putting Down Roots has some answers. British (called Yankees in this book) German, Norwegian, Irish, Danish, Polish, and Finnish are the Europeans which the author reviews. You can actually see these recreations of the original gardens at Old World Wisconsin-the largest of the Wisconsin Historical Society’s living history museums. It’s in Waukesha County-576 acres in Eagle. These are historically accurate gardens which complement the settings of a dozen homes from the above ethnic backgrounds. 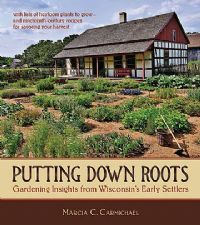 These researched gardens, according to the author, are filled with vegetables, flowers herbs and fruits of varying colors, textures, flavors and fragrances. Each nationality has its particulars expressed in this book. Common to all are the drawings of tools which are charming in their simplicity and practicality. If you are faced with a distance between your water source and your compost for example, the “garden engine” might solve your aching back, shoulder, or hose problems. It’s kind of like a wheel barrow with a pump. It’s in the Yankee section. We can also thank the Yankees for replacing the scythe and grass sickle with the lawn mower which paved the way for acceptance of the labor intensive lawns which we “enjoy” today. The German section details much of the German industriousness which we witness as we hear news of the stable German economy. I want to look up “black salsify” or scorzonera to see if we can find it today. They pioneered gardening in rows and separated the kitchen garden from the flowers. They also gave us the wheelhoe, a form of cultivator. Peruse the Polish section and you discover that rosemary and myrtle were important at weddings. Stovewood construction or incorporating whole logs with concrete is also from the Poles. The Finns gave us an intricate root cellar idea. You’ll very much enjoy the photos of the restored homes which have been moved to Old World Wisconsin. The orderliness of the gardens and the lush growth make me want to drift back in a time machine to the late 1800’s. The seed catalogs from that time period and the drawings they contain make this book worth a look for those alone. The appendix is a bunch of tables which highlight the plants each ethnic group planted to eat. Also informative is the section on plants for dyeing. It’s well indexed and there’s a great bibliography for each nationality so that you can learn more. Here’s the biggest bonus—recipes for each group of settlers! I’m anxious to try the Irish “Boreen Brack” which is a kind of bread. There’s lots to see and learn in this book. Your library has Putting Down Roots. I hope you’ll dig it out! Last fall we moved our daughter to Louisville, Kentucky to finish up her college training in Radiation Therapy. This move was exciting, since it presented many new learning opportunities including the culture of Kentucky. One of our first learning experiences was the Kentucky Bourbon Trail, which is a program of nine Kentucky distillers that promote the bourbon industry. Kentucky produces the majority of all bourbon made world-wide, because of the limestone water supply. Since our family is a fan of wine and beer tastings, we decided to expand our taste buds and start bourbon tastings/tours on the trail. On a walking tour of the historic Jim Beam distillery, I couldn’t help but notice that the buildings were all black. As I looked more closely I noticed the trees were extremely black and looked like they had their bark blow-torched. I learned that it is because the trees and warehouses have been tainted by Baudoinia compniacensis, a unique whiskey fungus, found near distilleries. This particular type of black fungus is common near distilleries because it uses ethanol as a source of energy for growth. During the whiskey maturation process (expanding and contracting in and out of the barrels’ oak panels), at least 2% of whiskey escapes from the barrel as ethanol vapor. It is this airborne ethanol that stimulates fungal germination and provides some additional heat protective proteins to the organisms. Since ethanol is denser than air, when it meets the slightest bit of moisture (limestone water supply) you get whiskey fungus all over the place. At an eyeball distance it appears as a crusty coating. At a greater foot distance, it appears like ink staining. One final point in case you plan to participate in a bourbon tasting, Makers Mark has the best bourbon balls at the end of their tour and you get to sample four types of bourbons! I am continually amazed by the miracle of germination. The thought of a shriveled up seed, some the size of a grain of salt, eventually becoming a lush mass of blooming beauty never ceases to fascinate me. While there are some basics to starting your own seeds, there is too much information than can be shared in this article. If you really want to get serious about starting seeds I suggest getting a book on plant propagation. While seed packets share important information on planting depth and germination time, there are often helpful hints that can be shared about specific cultivars that can make your plantings more successful. For example: Did you know that morning glory and sweet pea seeds should NOT be handled with care? To help them germinate it’s recommended that you scrape the seeds with sandpaper or even nick them with a knife. If that’s not enough, it should be followed up by an overnight soak in lukewarm water before finally planting them in the soil. Stir in some eye of newt and you’re done! Well, okay, maybe not that last part. But it’s these types of specific instructions and tips that a good propagation book can offer. ␣␣Light (TIP: It’s not necessary to spend a lot on expensive grow lights. Research has shown that a few bright standard fluorescent shop lights work just as well. )[Note: to make your own grow light, see our blog post of January 26, 2016]. ␣␣Clear Cover/Dome (If you don’t get a clear “greenhouse” dome with your trays, simply use plastic wrap. The key is to let light in while keeping moisture in too. 1. Moisten your soil mix and place it in your choice of container. Mark each container with the plant name and date of planting. 2. Following the seed packet instructions, plant your seeds at the recommended depth. For some seeds like Impatiens, this just means pressing them onto the surface of the soil because they need light to germinate. For smaller seeds I generally plant 3-4 per cell. For larger seeds like Nasturtiums I only plant 1-2. 3. Cover the trays with a clear covering and place on top of your heat mat. Some seeds may not need as much heat to germinate, but some plants, like peppers, will struggle to break the ground without it. Check your packet instructions and plant propagation book. 4. Let there be light! Provide lots of bright light for your plants and wait for them to sprout. While some seeds planted beneath the soil surface do not require light to germinate, I have found that it didn’t hurt, and provided some ambient heat. Generally, keep the light close to the plants, but not touching. Keep record of your plantings in a notebook and mark when you should expect to see sprouts. Note what things seemed to work well and what didn’t so that next year, you’ll remember that you had better success planting your Hyacinth Beans in plain old potting soil than you did in the seed starting mix, as I did. Upon seeing the first sign of sprouts you should definitely get the trays under bright light. It is not necessary to give the plants a dark period if you don’t want to. It is fine to just leave the lights on them continuously. Once the seeds have sprouted, you can remove the clear covering to allow air flow. When the first set of true leaves appear place a fan to blow on them gently and help them strengthen their stems. Keep the seedlings moist by watering from the bottom and allowing the soil to soak it up, but don’t over water. For instance, tomatoes like to dry out a little bit between waterings. Over watering is usually the biggest mistake, putting added stress on tender seedlings, plus it can cause mold to grow and provide an atmosphere for diseases like damping off. Once you have nurtured your seedlings to the point where they’re ready for the outdoors, begin to “harden” them off. What this means is slowly introducing them to their new environment. This can be done by bringing them outside during the day in a protected area and back inside at night when temperatures dip lower for a few days or so. The attempt here is to try to avoid shock when transfer- ring from their controlled environment to the unpredictable mood swings of a Wisconsin spring. Eventually, they will accustom themselves to the new climate and they will be ready for planting outdoors once the chance of frost has passed. As a person who works full time and often doesn’t get home until early evening, I sometimes feel like I’m missing out on the prime hours for enjoying my garden blooms. By the end of the day many flowers can look tired, and some, like morning glories, have already shriveled up in the day’s sun and heat. So, when I discovered flowers that saved their best show for the evening hours, it intrigued me. Now, many of these late-day bloomers are on my list of favorites. Typically, flowers classified as those fitting for a “moon garden” won’t open until night or late afternoon. However, there are others that may be open all day, yet release their intoxicating scent as evening approaches. This is one of the main reasons I love to grow some of these beauties in pots or near walkways, so I can enjoy their lovely scent as well. Why do some flowers wait until darkness approaches to open? Well, there are several night-flying pollinators such as moths that feast on these beauties. It’s suspected that the alluring fragrance helps attract insects when low light conditions can make them more difficult to find. This may also explain why these types of flowers are often white. The light color is more likely to reflect the moonlight and advertise their beauty to passing moths and other insects. 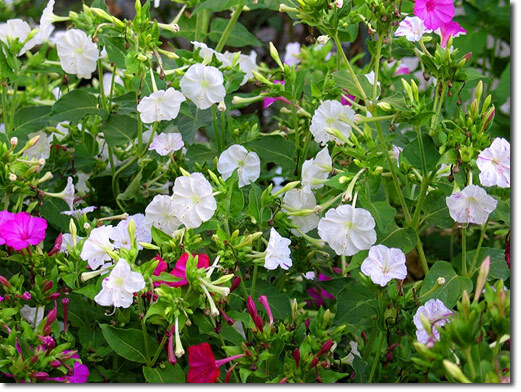 Personally, I feel white is underutilized in the garden and I love mixing it in with colorful annuals to make them pop. Here are the top five favorite moon garden flowers I’ve found through the years. 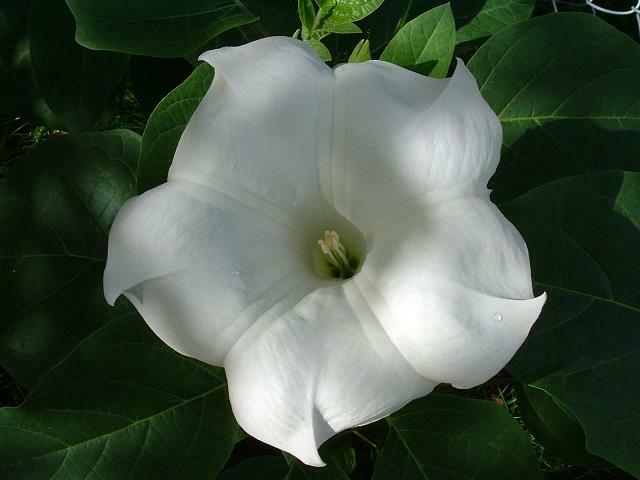 Moonflowers have large 6” flowers on 8-15’ vines that look similar to morning glories, which is understandable since it is a close relative. On a warm summer night you can literally watch the large blooms unfurl from their twisted bud in a matter of minutes. It’s often the subject of time-lapse photography for this reason. The blooms open at dusk, but close by noon the next morning. But not to worry, the vine will produce blooms in abundance from day to day. It is a tender perennial vine that is winter hardy to Zones 10-12, but grown as an annual here in full sun. It can grow to 70’ in more tropical climates. Start seed indoors about 6-8 weeks before last spring frost date. Starting seeds outdoors delays the onset of blooms until too late in the season to be fully enjoyed. I have grown this towering heirloom variety for several years from seed. It’s hard to imagine that the dust-like seed can grow to become this stately 5-6’ plant. 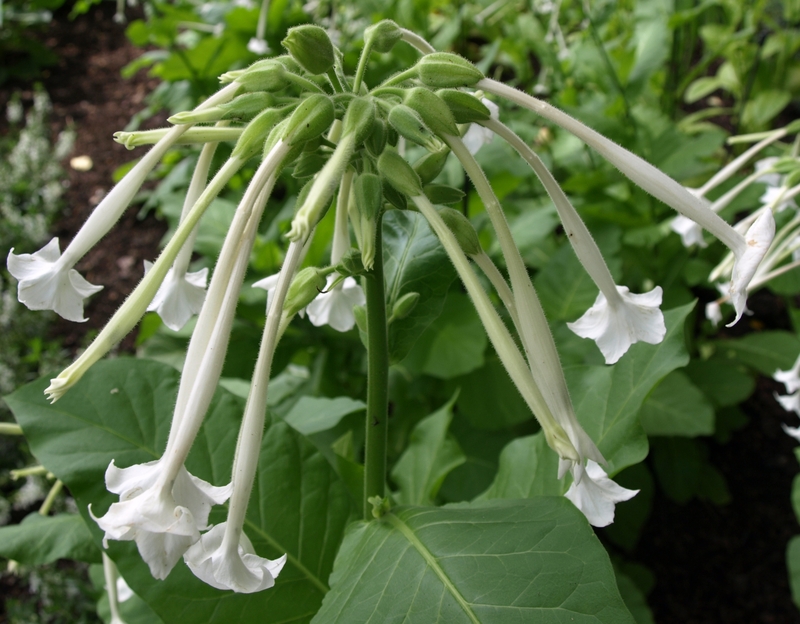 It is often referred to as Woodland Tobacco, and has 3-4″ hanging trumpet-shaped white blossoms. Once again, it is a tender perennial, grown as an annual. The white blooms open towards evening with a delightful light scent. It prefers average to fertile soil and may need staking in windy sites. It may reseed, but I’ve not had a problem with it becoming invasive. The leaves are very large at the base, forming a rosette of dark green, from which the tall spike of dozens of white trumpets grow. It does well in light shade. As their name suggests, these beautiful tender perennials open late in the day on bushy plants with lush, glossy foliage. It is also known as the Marvel of Peru, also a very fitting name, since the Latin definition of its genus name means “amazing, wondrous, or remarkable.” A fifitting name for the tubular trumpet-shaped flflowers that just keep coming day after day in abundance. In Wisconsin it is grown as an annual. Even so, the plant grows quickly and can almost appear shrub- like for use as a small hedge, growing to three feet. Unlike many other night bloomers, these trumpet-shaped flowers are available in a number of beautiful colors ranging from red, yellow, pink, blue, white and even some beautiful marbled varieties. They prefer full sun. Their fragrance truly is outstanding. I had a plant in a large pot near my front door and loved sitting on the steps taking in the heady perfume. This plant can become quite large, resembling a small shrub or bush with medium sized leaves having a bluish hue. The flowers are large, facing upright, and opening towards evening. 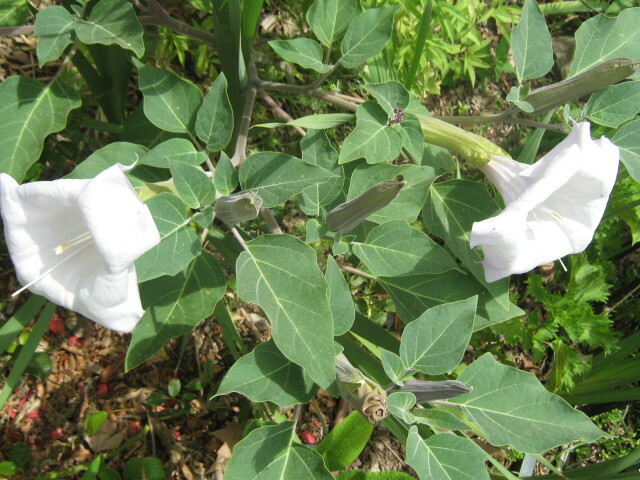 The name Angel Trumpet may refer to the angel of death, however. The plants are poisonous, so care should be taken in handling them. Daturas are so lethal that they have been used throughout history and literature as a means of killing a person. The cosmic-looking 2” seed pods with their bristly shell appear as from another world and have been known to reseed themselves. Despite its obvious faults, it is a beautiful flower, that properly placed, can add interest to your garden. 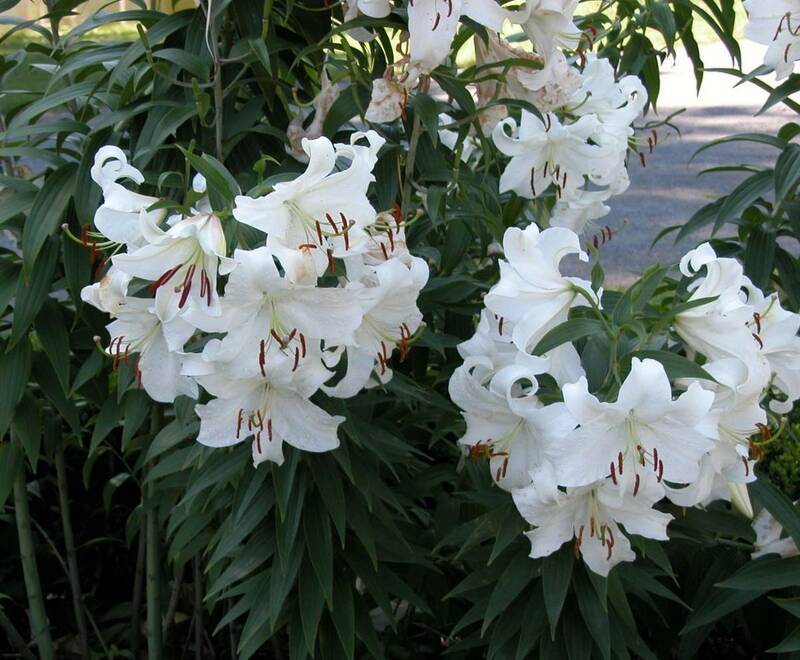 Technically not a night bloomer, the Casa Blanca Oriental Lily is readily incorporated into moon gardens because of its fragrance. In fact, it is one of the most fragrant flowers I have ever grown. One need not bend down to smell it, as its scent can be appreciated from yards away. Unlike most moon garden flowers, its blooms can last for more than a week, but each day its fragrance intensifies towards evening. Its immense 10″ flowers are so large that the thick stems may need some staking in windy locations. If you choose to grow one lily, this should be it. In my book, it’s a must-have. Be sure to try some of these beauties in your moon garden and enjoy their intoxicating beauty and fragrance.